Earlier this month, a team of dedicated Laurier students made their way to Mississauga to compete at the Enactus Regional exposition. The event involves universities from central Canada who compete based on the success of social enterprises developed by student entrepreneurs. Going into the competition as somewhat of an underdog, the Laurier team still set their sights high, attempting to walk away with a first place finish in one of the four categories they were competing in. After months of preparation the team presented their Mighty Hawks, Pollination and Earth Suds enterprises in categories ranging from financial literacy to entrepreneurship. 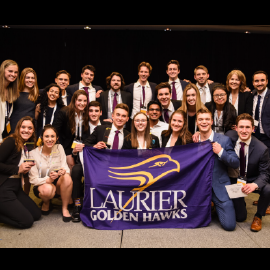 Laurier walked away triumphant, with two second place finishes and two first place finishes. With this, the team announced themselves as serious competitors at the upcoming national exposition in May where they’ll compete against schools from across Canada. In coming weeks, the whole group will be working to rapidly accelerate their businesses while honing their presentations for the national stage. Now that a successful regional competition is behind them, the team is looking ahead to nationals where they’ll be competing in three different categories. They’ll compete in the entrepreneurship and financial literacy challenges in which they earned their first place finishes at regionals, as well as the main Enactus competition to see which Enactus team will be representing Canada on the international stage later this year. “Although I knew they were good, the team exceeded my wildest expectations. Their passion and determination to make a positive change in the world fuelled them to such a strong finish. I couldn’t be prouder and am excited to see what the future will bring. It is an honour to work with these students; they are so inspiring” says Laura Allan, Faculty Advisor for Enactus Laurier. This Thursday, March 21 2019, the team will be hosting an event at 5:30 p.m. in LH1001 for anyone who is interested in joining Enactus Laurier. This event will be a celebration of the team’s success at regionals with food and festivities as well as an information session for students who want to learn more about the club and students who want to join Enactus Laurier. "Were looking for people with energy and a ton of passion for making real social change,” says Enactus Co-President Jake Fell. "If you are willing to work hard for something you care about, Enactus is the perfect fit for you!" If this sounds like you, Enactus Laurier invites you to come out on Thursday March 21st to celebrate the team’s success at regionals and learn how you can become a part of the next wave of Enactus Laurier champions. This enterprise is aimed at improving habitats for the decreasing population of local pollinator species while education youth about the importance of pollinators. Earth Suds goal is to replace plastic toiletry bottles with solid, single use tablets, in order to reduce the plastic waste in our landfills, oceans and natural environment. Mighty Hawks hosts weekly workshops for adults with developmental disabilities to grow their employment skills and help find them meaningful employment.